For the second summer in a row, I’ve celebrated July 4th outside of the U.S. Last year, I was in Singapore with the Carolina Southeast Asia Summer Program, and I commemorated the day with a fireworks show over Marina Bay Sands (a rehearsal for Singapore’s own independence day celebration later that month) and with Milo King Kongs (a rich milkshake-like drink) at a nearby Indian restaurant. But this year, SEAS spent the 4th in Bangkok, so our celebration took on a uniquely Thai flavor. We kicked off the afternoon with a visit to the United National Educational, Scientific and Cultural Organization, UNESCO-Bangkok. The organization’s mission is to “contribute to the building of peace, the eradication of poverty, sustainable development and intercultural dialogue through education, the sciences, culture, communication and information,” with a focus on Africa and gender equality. This year as SEAS participants, we have had the opportunity to take two courses, one of which focuses on nation-building and the formation of national identity. So the July 4th trip to UNESCO enabled us to ask questions about how global organizations work within the framework of nation-states while encouraging global agendas. After short speeches by UNESCO leaders in education, sciences and culture, we were invited to ask questions about the responsibilities of each branch. They used words like “promote” and “facilitate” to describe their roles in ensuring unity and education, but unfortunately, we couldn’t get past this official rhetoric. By “promoting” and “facilitating” education, what is UNESCO actually doing? We weren’t too sure. One thing we were sure of, though, was that Gwang Jo Kim, director of UNESCO-Bangkok, was a little put out with the U.S., which reneged funding after UNESCO voted to admit Palestine into the organization in 2011. As patriotic Americans, we’d dressed in red, white and blue, a fact that Mr. Kim glossed over, hoping that we were from Europe and Asia. But by the end of our visit (when he’d finally ascertained that we were, in fact, problematic Americans), we came away with the knowledge that all of this “promoting” and “facilitating” would have been a lot easier with U.S. funding. After our UNESCO meeting, we were in need of some good ol’ American grub. With fireworks and a weenie roast out of the question, we headed over to McDonald’s for burgers and fries. 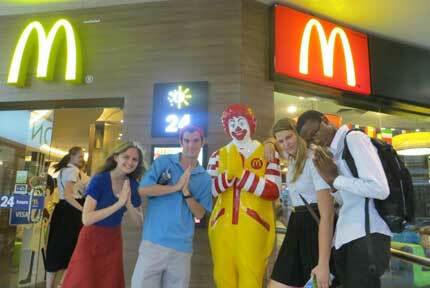 We were greeted at the door by a wai-ing Ronald McDonald, who, according to Thai custom, was folding his hands and bowing his head in welcome. Of course, the menu in Bangkok is a little different from the one in the U.S. While my friends ordered Big Macs and chicken nuggets (and super-sized for a mere extra 10 baht), I decided to try a uniquely Thai option: The McSpicy gave the normal chicken sandwich an extra kick and didn’t require the large dollop of chili sauce the server had kindly provided me. Then, figuring we might come across a July 4th celebration, my friend Adam and I headed over to Khao San Road, a notorious backpackers’ haven. What we hadn’t counted on was the demographic of the backpackers. Yes, Westerners swarmed the area, but we were seemingly the sole Americans. So, we spent the evening celebrating July 4th with the very people who had granted us independence. In other words, our fellow Brits hurried past us, turning their heads in shame. Somehow they had also conspired to hide the firecrackers and American flag T-shirts we’d been so sure to find. So our celebration ended with a European twist, buying Magnum Classic bars — a Denmark ice cream specialty — at the 7/11, followed by a long taxi ride home in Bangkok traffic. Still, this July 4th celebration will go down as one of the best. After all, cookouts and sparklers are fun, but how often do you have the chance to boast your national pride in front of members of the tea-drinking Motherland?